A microscope is an instrument used to see objects that are too small for the naked eye. There are many different types of microscopes. The first microscope to ever be used was an optical microscope, which uses light to image the sample. Optical microscopes are now the most common type of microscope. Other major types include the electron microscope and the different types of scanning probe microscopes. 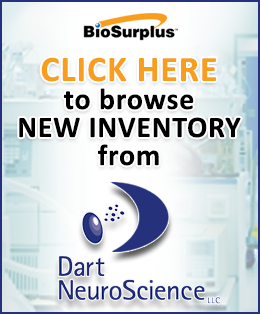 At BioSurplus we carry a full line of new and used microscopes from all major vendors including Olympus, Perkin Elmer, Leica, Zeiss, & VWR VistaVision. 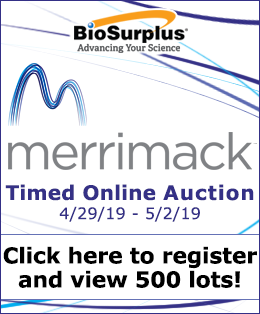 Learn how compound microscopes obtain such high power magnification and also other types of microscopes for sale at BioSurplus, including confocal, scanning electron, dark field, and many others. The optical microscope uses visible light and a system of lenses to magnify images of small samples. Designed several hundred years ago, optical microscopes are the oldest types of microscopes. Optical microscopes are fairly simple, although there are complex designs that improve resolution and sample contrast. There are 2 types of optical microscopes: 1) compound microscopes also known as light microscopes produces a mono (2D) image, and 2) stereo microscopes, also a compound microscope, produces a 3D image. For compound mono microscopes, there are 2 configurations available: 1) inverted and 2) upright. Other than the orientation of the components, the principles are the same. Because of the position of the microscope, you can place an entire culture in relatively large container such as a petri dish or cell culture flask and look at the entire contents in more natural conditions. Requires specimen sample to be removed and placed onto a glass slide under a cover slip. Conditions are not natural and may cause stress for the organisms. Normal light-sensitive cameras can capture images from the microscope with photographic film. With the latest developments in CMOS, charge-coupled device (CCD) cameras allow the capture of digital images. Digital microscopes are now available that use a CCD camera to examine a sample. The resulting image is visible directly on a computer screen, and there is no need for an eyepiece in these designs. Alternatives to optical microscopy that do not use visible light include scanning electron microscopy and transmission electron microscopy. An electron microscope uses an electron beam to illuminate the specimen and produce a magnified image. An electron microscope has greater resolution and power. Consequently, they can show the structure of smaller objects and specimens. They can achieve better than 50 pm resolution and magnifications of up to about 10,000,000x compared to optical microscopes that are limited by diffraction to about 200 nm resolution and useful magnifications below 2000x. The electron microscope uses electrostatic and electromagnetic lenses to control the electron beam and focus it to form the image. Electron microscopes are used to investigate the wide range of biological and inorganic specimens including microorganisms, cells, large molecules, biopsy samples, metals and crystals. Today many use specialized digital cameras or frame grabbers to capture the image for display on a computer screen. The first scanning probe microscope was developed in the 1980s. Images of surfaces are formed using a physical probe that scans the specimen. Resolution varies from the type of technique; some probe techniques can reach atomic resolution. Recent developments in light microscope are focused on the rise of fluorescence microscopy in biology. Techniques for the fluorescent labeling of cellular structures were developed in the late 20th century. The main techniques used are small chemical staining of cellular structures. For example, DAPI is used to label DNA and antibodies are conjugated to fluorescent reporters and fluorescent proteins, such as green fluorescent protein. These techniques use different fluorophores for analysis f cell structure at a molecular level in both live and fixed samples. Current optical microscope research techniques are focused on the development of superresolution analysis of fluorescently labeled samples. Structured illumination can improve resolution two to four times. Techniques such as stimulated Emission Depletion microscopy are approaching the resolution of electron microscopes. An inverted microscope is a microscope designed with the light source and condenser lens above the specimen. The objective and turret of the microcope is located on the bottom. This is upside down from the conventional optical microscope. Inverted microscopes are commonly used in cell culture, aquatic specimens, and metallurgy. It is useful for observing living cells or organisms at the bottom of a large container (e.g., a tissue culture flask) under natural conditions. The stage on an inverted microscope is usually fixed, and the focus is adjusted by moving the objective lens along a vertical axis to bring it closer or further from the specimen. Depending on the size of the microscope, four to six objective lenses of different magnifications may be fitted to a rotating turret known as a nosepiece. These microscopes may also be fitted with accessories for fitting still and video cameras, fluorescence illumination, confocal scanning and many other applications. A compound microscope has a very high magnifying power. It uses multiple lenses for viewing very small particles such as bacteria and viruses. The first lens (objective lens) focuses on the image of the object inside the microscope. The second lens (eyepiece) gives a larger inverted view of the object. This combination allows for the higher magnification from a simple (single lens) optical light microscope.